How many moms can give me a big Amen when I say I don’t want to ever step on another lego again??!! If you have ever walked into your child’s room in the dark only to step on a pile of legos then you will never forget the pain. 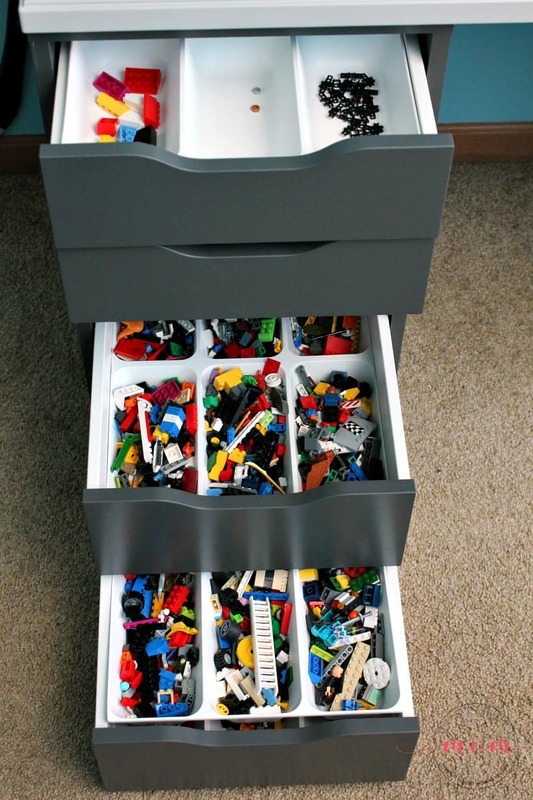 That’s why every lego-loving child needs this easy DIY lego desk to hide AND organize the legos (and more importantly, get them off the floor!). 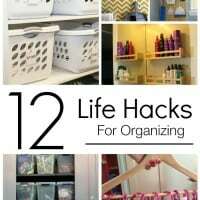 It’s a fun lego tables Ikea hack that my husband and I came up with and I’ll show you how to do it. No skills required! I finally said enough is enough with my son’s messy room and vowed to get him some proper lego organization so he would not only have somewhere to put all of his legos, but also have a place to display his finished creations. I could hardly scold him for his messy room when he didn’t have anywhere to PUT the legos in the first place. So I drug my husband to Ikea and spent hours wandering around in search of the perfect lego tables Ikea hack I had in my brain. After hours of trial and error this DIY lego desk was born and I have to say, it’s worked brilliantly! 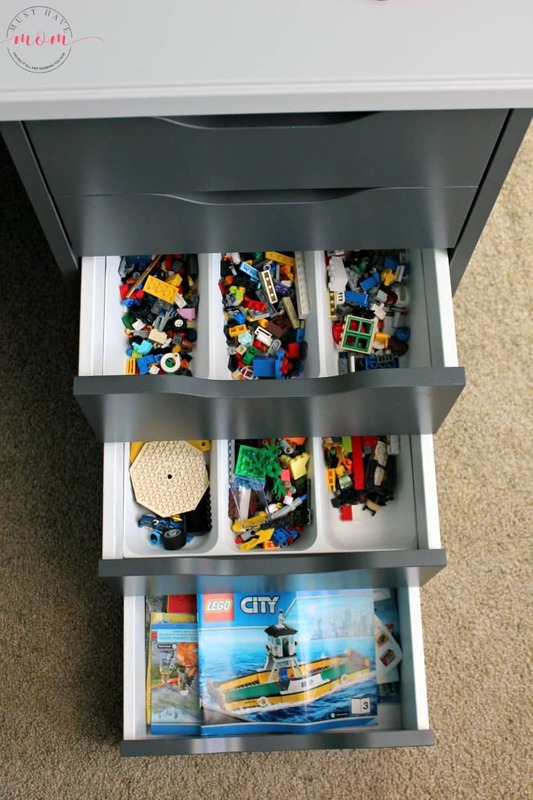 One thing I LOVE about this lego desk is that it HIDES the lego mess when my son isn’t playing with them and it also ORGANIZES the legos so he can easily find the pieces he needs when he is busy building. 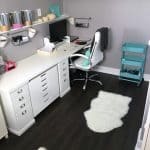 To create this lego tables Ikea hack desk we took 2 of the Alex drawer units and 1 Klimpen table top and put them together to create the desk. 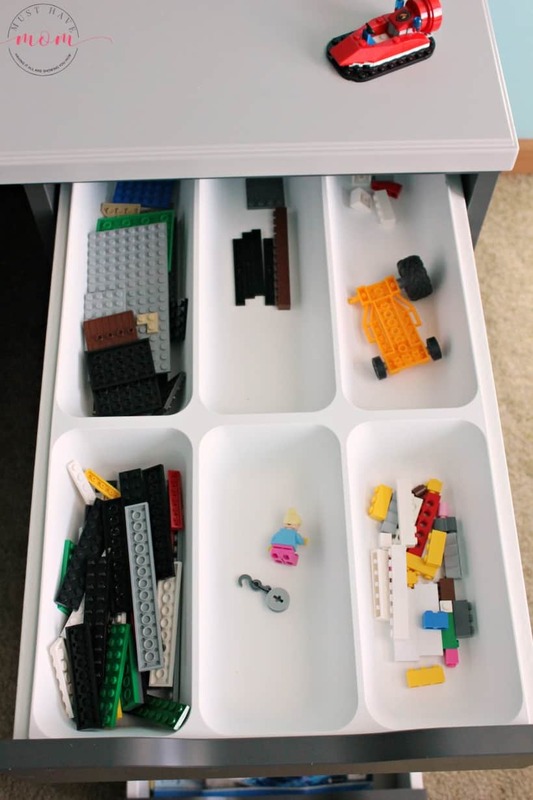 Then in the drawers we added the Variera flatware trays to organize the legos in divided sections. 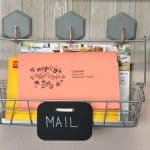 In the 3 bottom drawers that are deeper, you can fit 2 of the trays stacked on top of each other (opposite directions so they don’t nest together) for double the space! The organizers fit perfectly and house the legos nicely. We decided that sorting the pieces by shape was going to be a job for another day! 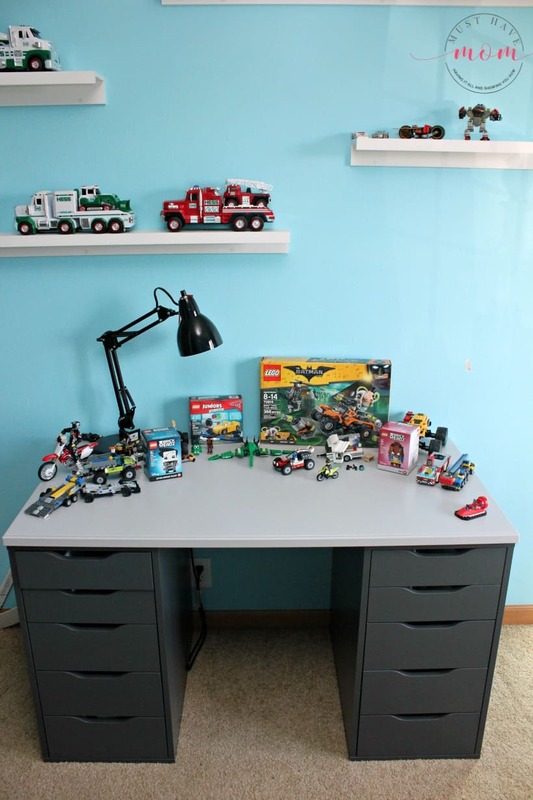 We are LOVING how organized Aiden’s lego desk is! We left one bottom drawer without an organizer insert so he could neatly store all of his instruction booklets. Now he can access them anytime and easily find the pieces to build each project. This lego tables Ikea hack has been a lifesaver! Now Aiden sits at his lego desk for hours and builds all sorts of creations! 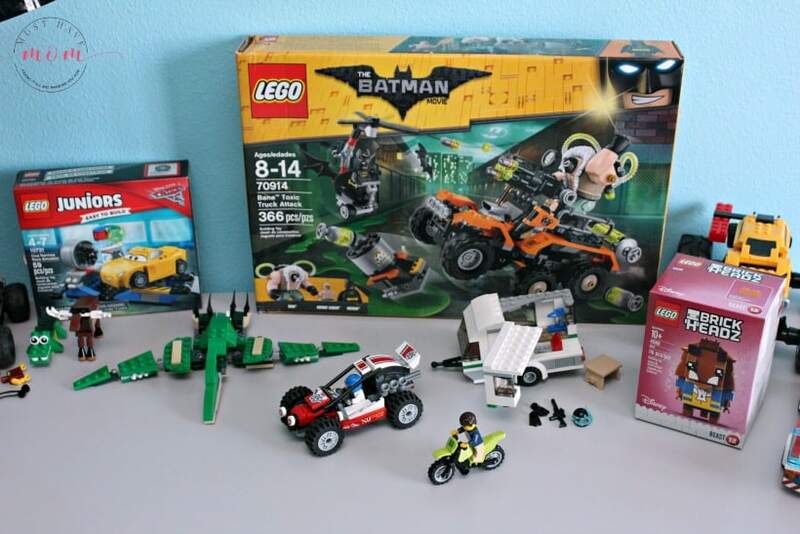 His latest favorites are the Lego Batman Movie Bane Toxic Truck Attack set which he built in no time and has played with ever since. My son Carson LOVES the Lego Juniors Cars Cruz Ramirez Race Simulator set and my daughter is a big fan of the Lego Brick Headz Beast! We also added some shelves from Ikea above the lego desk so Aiden can proudly display all of his finished Lego creations! It was SO easy to put this lego tables Ikea hack together (once we figured out which pieces to use!) and I’m so happy to not be stepping on legos anymore! What a great idea! 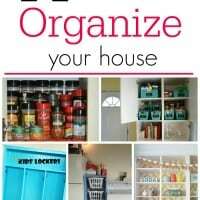 I love the trays inside the drawers! Pinned! Thank you for sharing on Merry Monday! Have a great week! Love this!! There are 2 tabletops. Which size did you use? Hello, how did you attach the tabletop to the drawer units or is it just sitting on top of them? It just sets on top. It includes clear, round pieces to help hold it from sliding around.